Cattell, in the 1960’s, defined two sets of intelligence that were inextricably linked: that of fluid and crystallised intelligence. According to Cattell, one’s aptitude to solve for novel problems, apply cognitive tools to new situations and identify patterns, outlines their fluid intelligence. Crystallised intelligence, on the other hand, envelops one’s ability to take what they have learnt (e.g. facts and beliefs about the world) and apply it to a novel situation. The depth of one’s given crystallised intelligence is correlated to their fluid, as the fluid determines one’s capacity to learn and integrate new information. Both fluid and crystallised intelligence are measured using standardised IQ tests. These tests, often, involve one having to identify an association between two far reaching words (e.g. sea and music = rhythmic wave), define progressively trickier words (e.g. 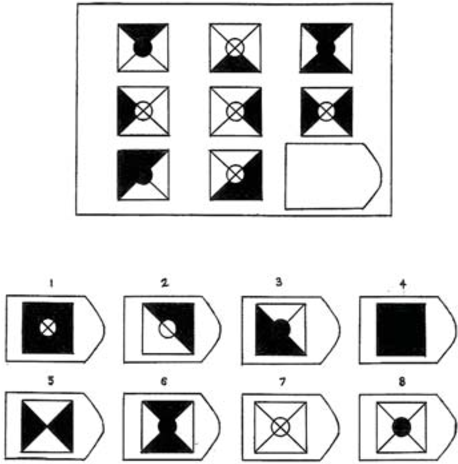 from comfortable to tranquil) and solve analytically identifiable, but abstract patterns that require you to hold a lot of information in mind (see figure 1). Figure 1: An item from the Ravens Progressive Matrices that requires you solve for the missing piece of the 3*3 grid (answer: 4). The human population, unsurprisingly, demonstrates a sparse level of individual variability when it comes to their intellectual capabilities, at least when measured by IQ. Most individuals’ scores on this test correspond to the mean, or average of the population i.e. 100 points, yet some drop below that line i.e. 85 points and some ascend past the mean i.e. 115 points. Hitherto, the brain-based differences causing this dispersion of intellectual capability within the population has been an unknown. A study led by Natalia Goriounova at the Free University Amsterdam has perhaps provided a photon of illumination concerning these differences in intellectual capability. Goriounova’s research team administered IQ tests to 35 patients awaiting brain surgery. During surgery, a small sample of brain tissue of each patients’ temporal lobes was taken and maintained in the lab. The thickness of cortical grey matter (compilation of neuronal cell bodies) within the temporal lobes has been consistently shown to have a relationship with IQ. Cortical grey matter, composed of neuronal cell bodies, in large part contains the contents of a cells dendrites: spiny protrusions from the cell body that receive information from other cells and propagate such information to the main cell body for integration. Within our temporal lobes and frontal cortices, an extremely complex and unique neuronal cell dwells: the pyramidal cell (see figure 2). These cells harbour astonishing complexity and size. These properties, therefore, make the cell a great conductor and integrator of information that may come from distant as well as local brain regions. Figure 2: A drawn pyramidal cell (the spindly branches that extend out are the cells’ dendrites). 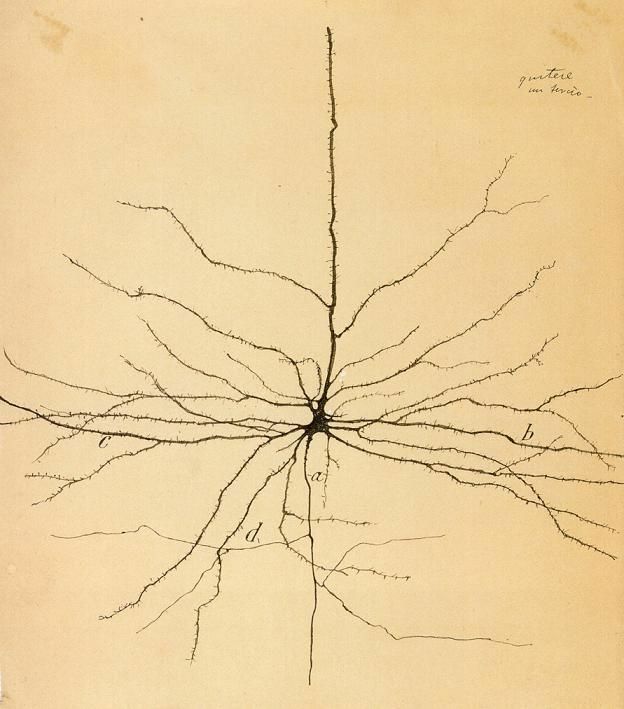 Goriounova’s team compared the size, dendritic complexity and efficiency of these pyramidal cells to the volunteers’ measured IQ. They found a significant correlation between IQ and the pyramidal cells’ dendritic length as well as complexity (number of branched dendritic segments). The researchers tested how efficiently these cells could fire-off electrical transmissions in response to stimulation (mirroring normal neuronal communication) and compared this electrical potential to volunteers’ IQ. The cells belonging to people of a lower IQ (below 100) could fire-off electrical signals at an average rate, yet, when pushed to send signals at an elevated frequency of stimulation, became quickly fatigued. This was in comparison to cells belonging to individuals of a higher IQ (above 100), who could continually transmit consistent electrical signals, regardless of an elevated stimulation frequency. In practise, those of greater intellectual potential, on a cellular level, can receive, integrate and then communicate information in a more consistent and sustainable manner. This cellular activity would likely cause a greater consolidation of learnt information and a greater potential for that information to be integrated with other bits of information, as well as shared with other neurones. The temporal lobes are usually considered as a “hub” for semantic information, or a place where bundle of learnt things about the world are packaged up into the most apt categories (e.g. leopard and macaque monkey would be stored as mammal). It’s curious, then, that pyramidal cells within these lobes are the ones to be found – in people with a greater IQ – to be firing and taking in information more efficiently. This finding could attentively suggest that those with a higher IQ may have better access to semantic categories and when into the hub, can hold the retrieved information in mind, as well as manipulate it, more readily – as their cells do not fatigue with increased stimulation. Since neuroscientist have the ability to culture these magnificent pyramidal cells in the lab through the use of embryonic stem cells, it follows that they can also manipulate the size and complexity of the cells’ dendrites. Theoretically, then, we could very well have the potential to make our intelligence, on a case-by-case basis, a lot more malleable or even increase it just by placing these stem cells within out brains. Pyramidal cells, after all, have been grafted into the brains of mice, so we might not be far off. Previous Post Liberalism or cultural homeostasis, but not both.